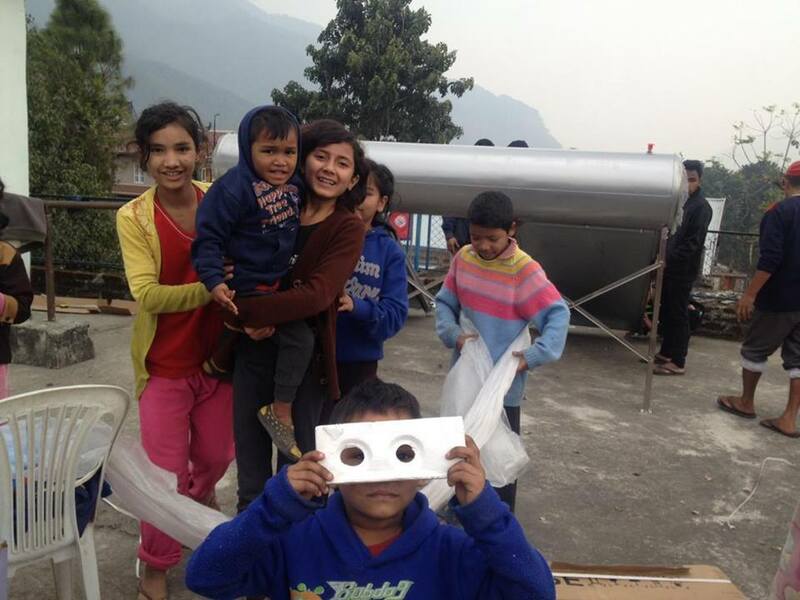 In January we had our 5th annual field trip with our family from the IWCDC children's home in Besisahar, Lamjung. This year we had an adventure in Kathmandu where the kids got to see many of the historical sites of their country that they've only read about in their school text books. 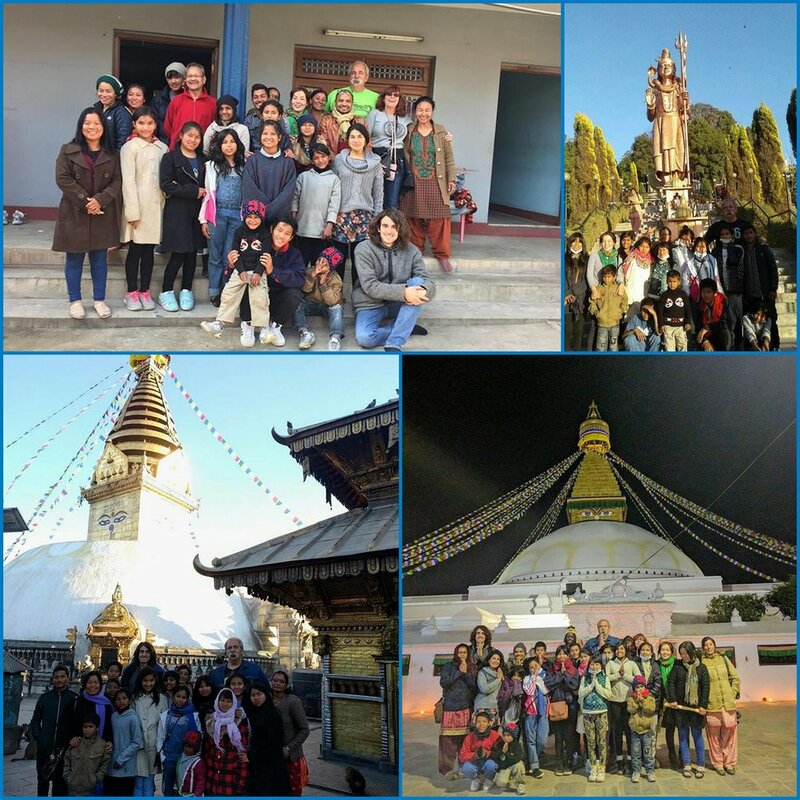 We visited a lot of places in their 3 days 2 nights trip such as Swoyambunath, Boudhanath, Pashupatinath, Patan Durbar Square, the zoo and many others. Rotary Club of Pokhara Fishtail recently distributed 100 more female sanitary pad kits SCF sponsored and provided training on reproductive health in a remote area of Tanahun at the Firfire Higher Secondery School. 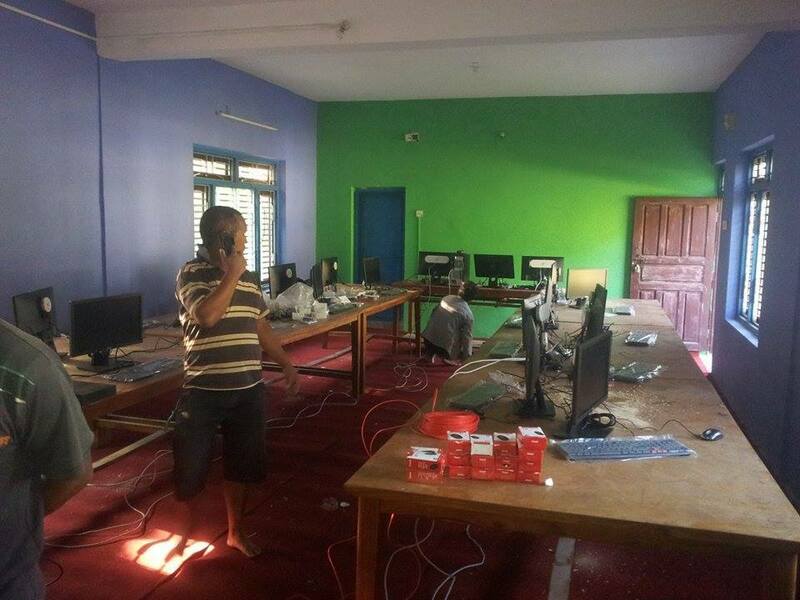 We've identified Barahi Secondary School in Pokhara as the next school to sponsor a computer lab! Here are a few photos of the rooms before the work begins. The dividing wall between these rooms is being torn down and the room outfitted to support our upcoming learning center. The transformation will be amazing to see! In partnership with the Microsoft Innovation Center Nepal, we have sponsored the implementation of a computer lab at the MMC Campus in Lamjung Nepal. The facility will be used as a electronic library as well as to begin introducing diplomas in computer science! 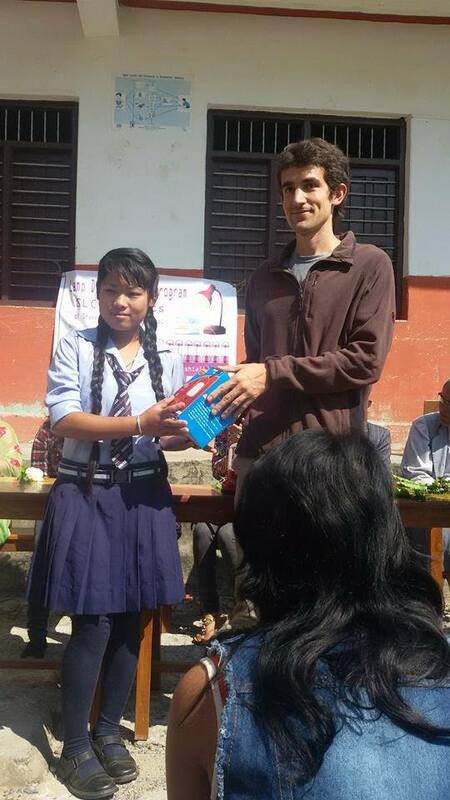 SCF is sponsoring the distribution of 400 washable and reusable sanitary pads to school girls in the district of Kaski. Each school girl will receive 2 sanitary pads, maintenance materials, and education on female reproductive health. 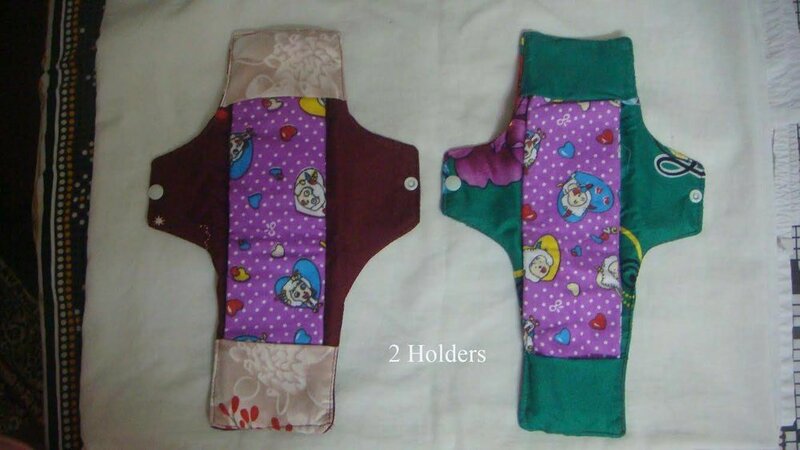 The sanitary pads were produced by women in financial need and were paid wages to help supplement their income to support their families. 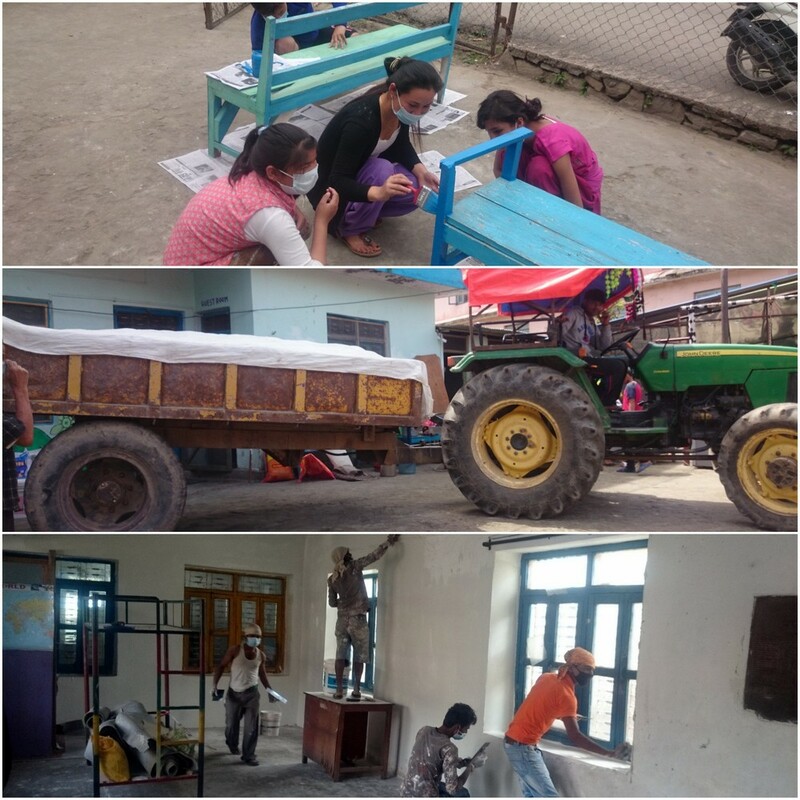 SCF has sponsored the purchase of learning materials, furnishings and carpeting for a new Early Childhood Development Center in Gaunda, Nepal that was recently rebuilt after being impacted by last years earthquake. We have some lovely news and a new scholarship to announce! For those who know our friend Pratikshya, she has been reunited after many years with her brother. 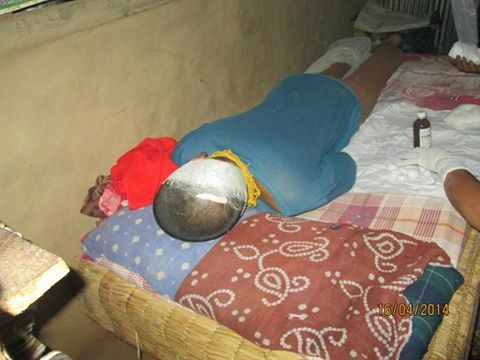 He recently became of age to leave the Children's home he was living at in Chitwan. We'll be providing him with a college scholarship to study hotel management and he will be living together with his sister. We're really proud of him, Pratikshya and all of you who continue to support our work! Jyoti stopped by this week with her father to receive the second instalment of her college scholarship! She graduated top of her class in secondary school and her family was unable to afford college. With all of your help, she's able to continue her studies and bring a bright future to her family. 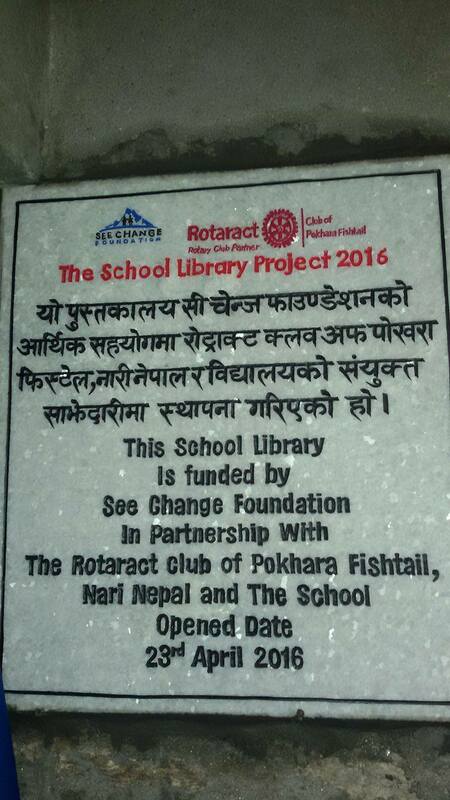 In partnership with the Rotaract Club of Pokhara-Fishtail, SCF is sponsoring the buildout of a library at the Bal Mandir Secondary School in Lumely, Nepal. In addition to the books and equipment, we are providing 3 years of library management training and the resupplying of books. Sanjaya and Chankhe came all the way from far western Lamjung to meet with our founder and volunteer, Erik, on his recent trip to Nepal and to receive their second year of scholarships. Both boys are maintaining a great position in their school class. 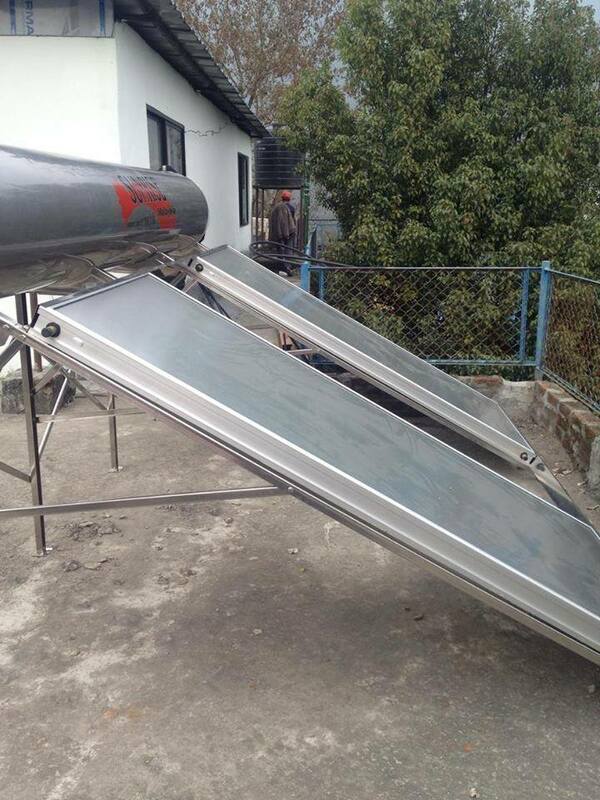 SCF has purchased a 500 liter solar water heater for our friends at the children's home. This is the first time in their lives they will be able to take a hot shower! In addition, we are remodelling the washing areas, showers and bathrooms. 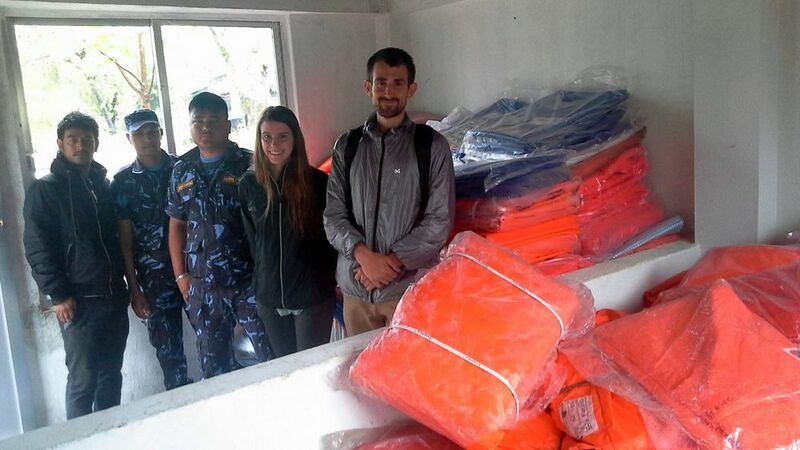 Our new SCF volunteer John has touched down in Lamjung! He'll be teaching English at a small government school and helping us carry out some of our rural healthcare and education projects. SCF sponsored an overnight field trip to Chitwan National Park for our friends at the children's home. All 23 kids had the opportunity to experience and learn about the Tharu culture, life in the plains of Nepal and see animals they've only read about in books - from crocodiles and elephants to wild rhinoceroses. It was a first time for everyone! Meet our very first college scholarship recipient, Jyoti! She graduated high school top in her class and also passed the college entrance exam. She wants to study science but her family does not have the means to cover her tuition. She's super brilliant and has the opportunity to be the breadwinner for her family of labour workers. We recently provided Samjhana her third semi-annual See Change scholarship. She's been rocking her classes and is able to keep in school thanks to you all. Samjhana and Niruta stopped by today to receive their yearly tuition scholarships. These lovely sisters were born into some unfortunate circumstances and are able to continue their studies thanks to their scholarship from SCF. They are happy, healthy and doing well in school. 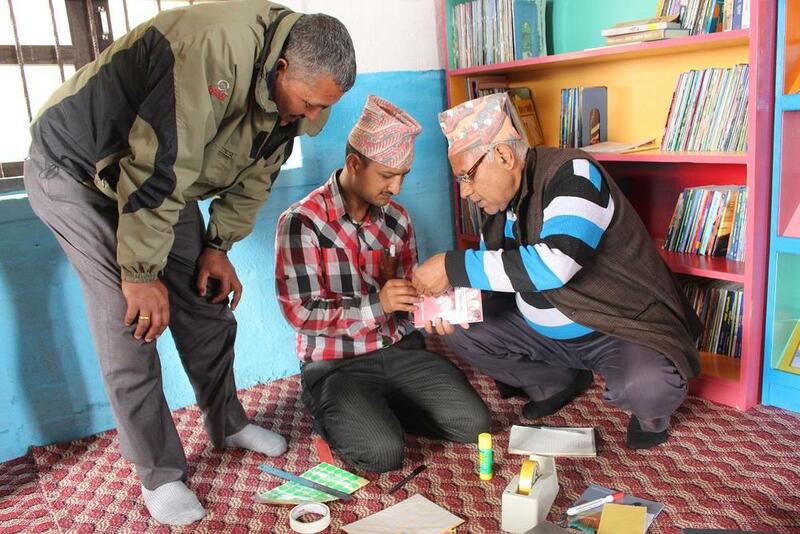 We recently distributed tin to the Saraswati Sadan Secondary School in Lamjung to build temporary classrooms. 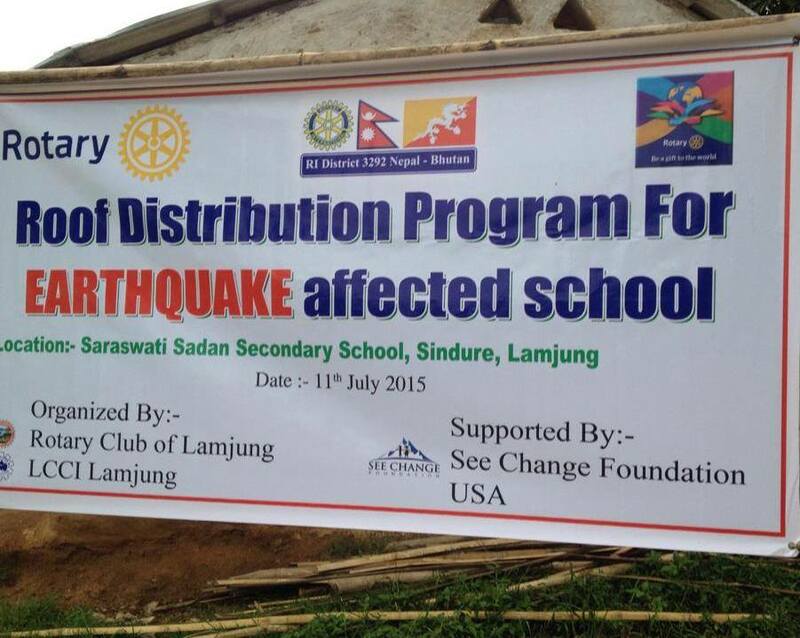 The distribution was in partnership with the Rotary Club of Lamjung and the local community. See the last picture in this post to understand how the kids have been studying outdoors and in the open since the earthquake. 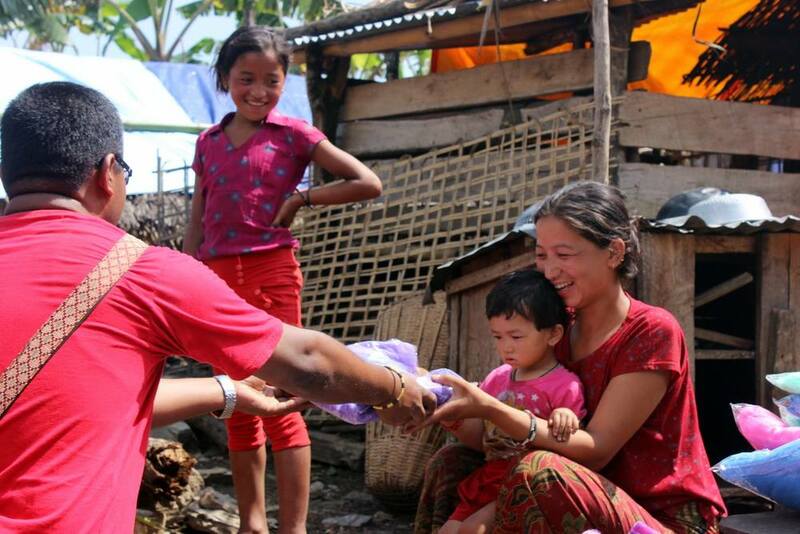 Over 300 mosquito nets have been sponsored and distributed in Gorkha and Lamjung. Recipients are families who lost their homes and are currently living in temporary housing structures. 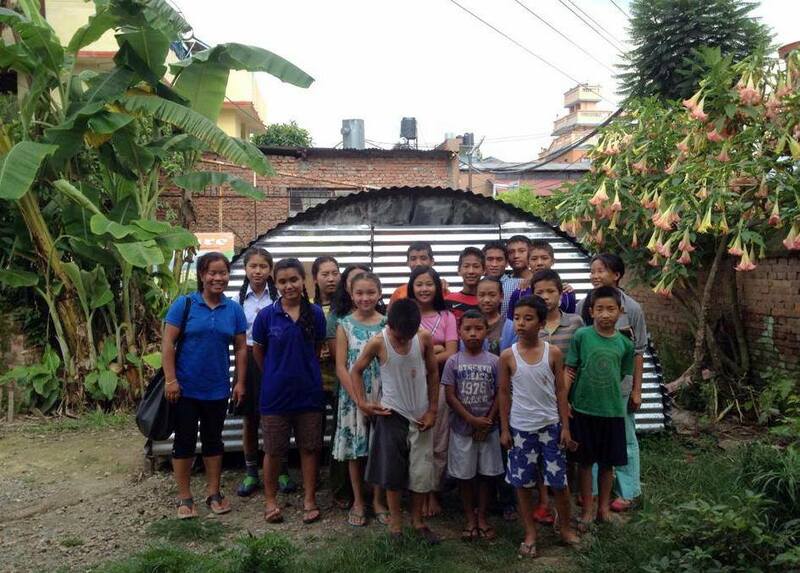 In partnership with cfnnepal.org, we have sponsored the construction of 20 temporary housing units for orphanages who lost their buildings. 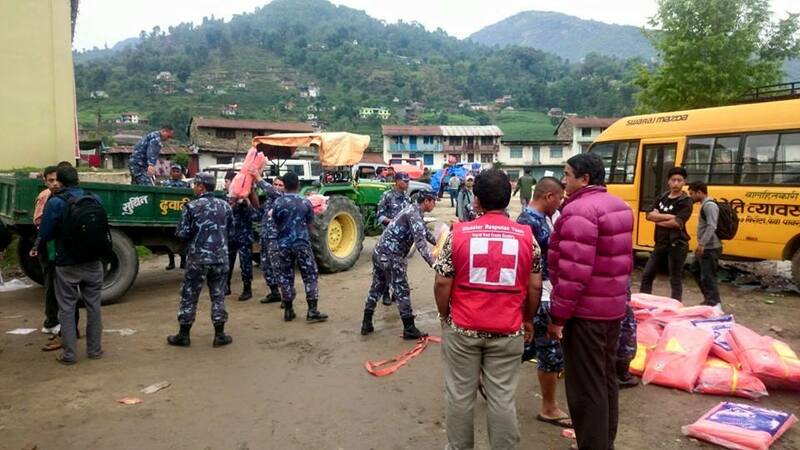 200 tarps have been sponsored and distributed through the Red Cross and Rotary Club of Gorkha to families who lost their homes in the quake. 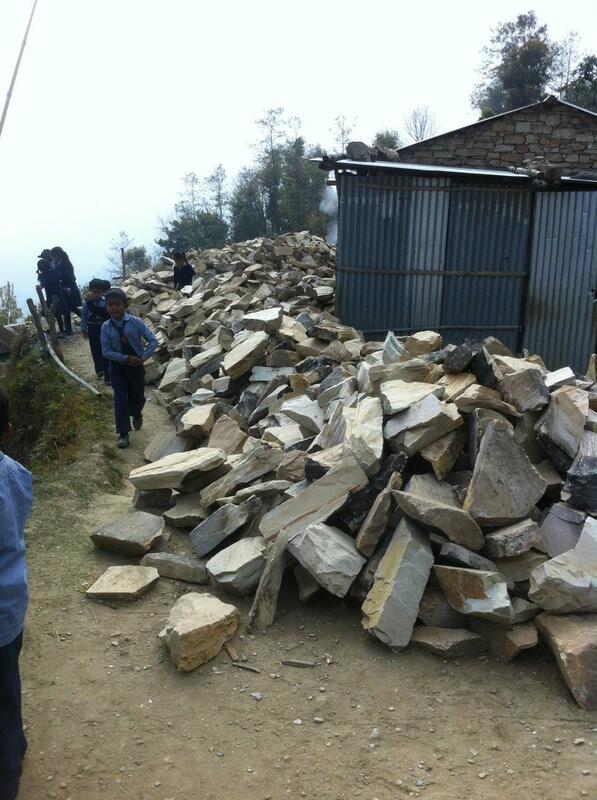 The district of Gorkha is neighboring to Lamjung and is among the hardest hit in Nepal. 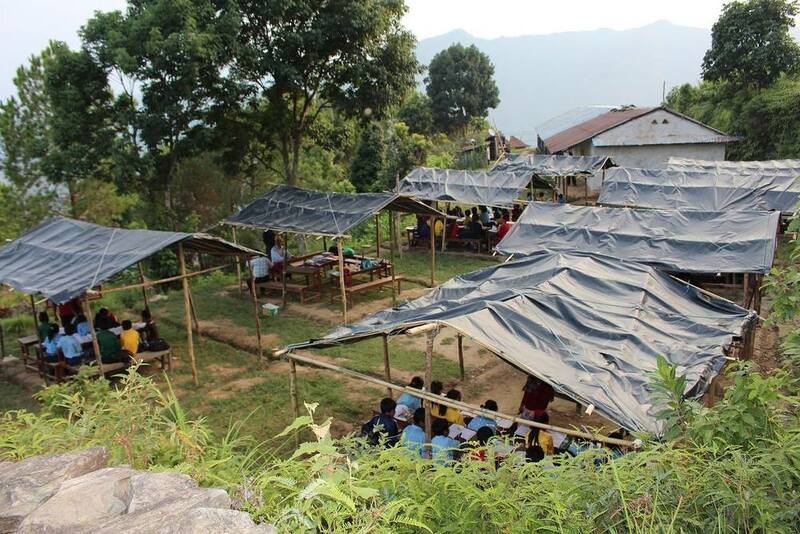 570 quality tin roofing sheets have been sponsored via the Rotary Club of Lamjung. 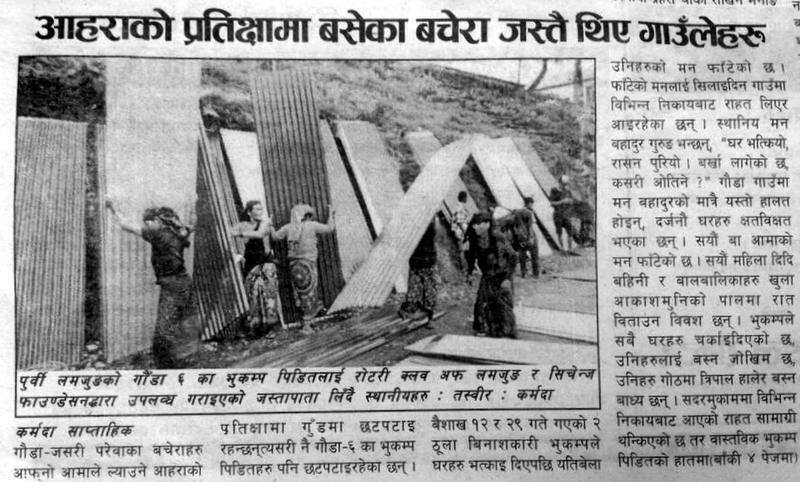 They will be used, along with bamboo, to create temporary housing for the 57 low income families who lost their homes in Gauda, Ward 6, Lamjung. The material will later be repurposed as the roofs of their new homes when the rebuilding phase begins later this year. In partnership with the Red Cross and sponsored by SCF. Taken just hours before the deadly earthquake. This has been a big priority for us - giving the local communities the skills to be a first line of defence for injuries. 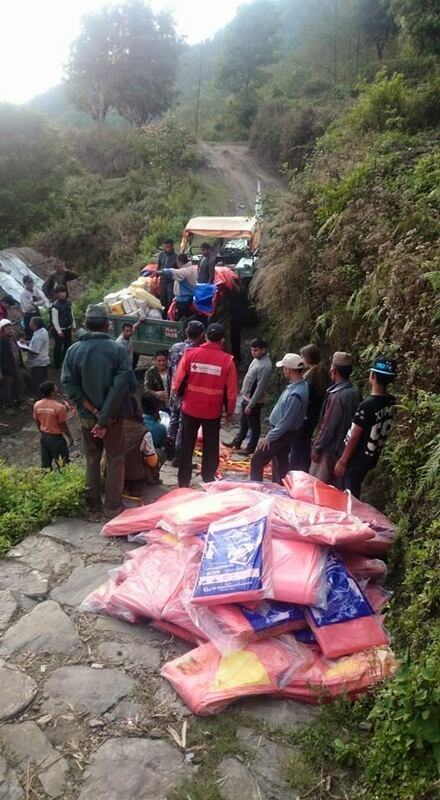 364 tarps have been purchased and donated to the Lamjung district police relief efforts for emergency housing. They are being distributed in partnership with local governments relief efforts and with the Rotary Club and the Red Cross. We spent the morning taking them around to get school uniforms, shoes and backpacks. They went to school last year unregistered and without proper school attire or supplies. Overnight trip to Kaulepani Tourism Village with the kids at the IWCDC Orphanage home. We spent the day learning about the local Gurung culture, hiking, singing, dancing and eating MOUNTAINS of rice. 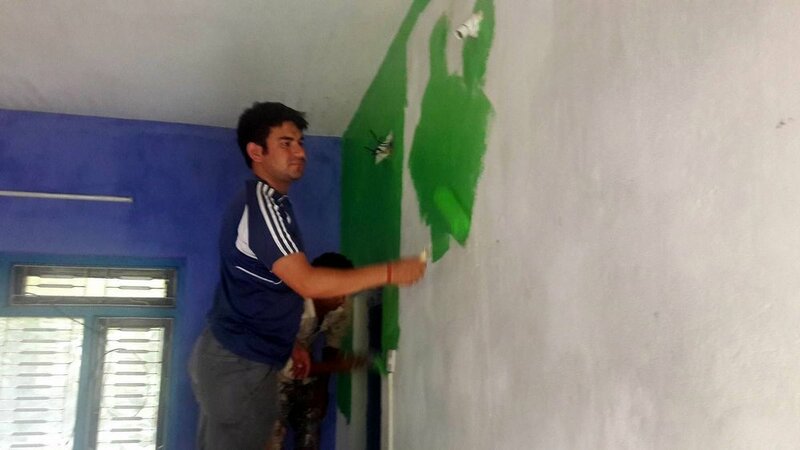 We have repainting the interior of the Orphanage home. Check out our Before and After pictues - it's starting to feel like kids live here! We will be hiring a plumber to fix all the broken water pipes at the Children's home. 3/4 showers are not functional, 1/2 outside taps are broken and the only sink in the dining room doesn't work. In addition, the home is running at 50% water storage capacity due to broken pipes leading to persistent water shortages. We renewed our yearly scholarships to Gautam, Saraswati and Bikash. They come from underpriveleged families and we are putting them in an advanced school to give them an edge in studies. They are joined by our new Volunteer, Maddie, who is helping cooridinate our rural projects. Just 13 of the 49 lights in the home were functioning when we started this project. The water pump, 3 out of 4 showers and backup water tank were all broken. We've fixed all the wiring, lighting, ventilation and plumbing issues in the entire home improving their hygiene, studies, security and overall welfare. The postcards have arrived! Our founder has donated 1000 postcards which we will be mailing out to every single one of our donors - past, present and future. It's our way of saying thanks for your continued support! In Partnership with the Rotary Club, we are distributing 18 water tank and micro-filters. They are being distributed to needy schools and community centers where clean drinking water is not available. 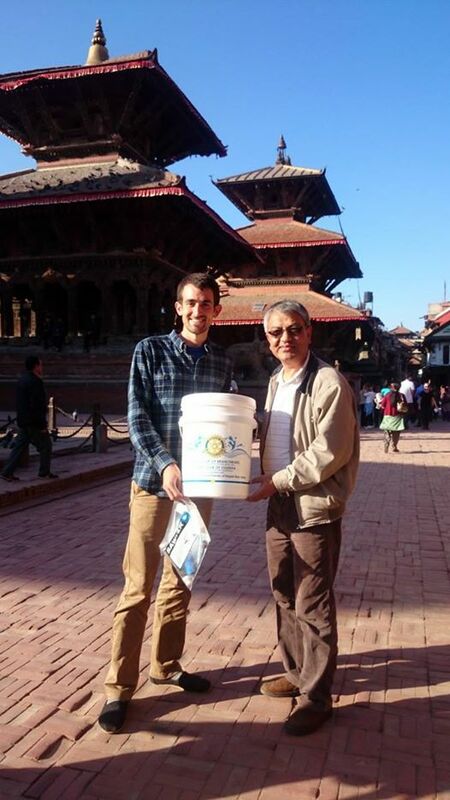 Our scholarship recipient Bikash meeting with SCF Founder Erik (the blue yeti). 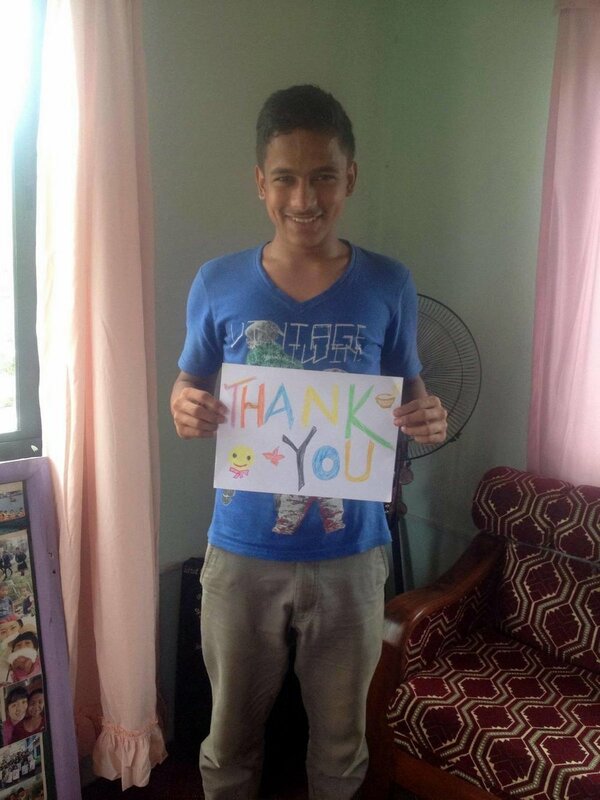 Bikash was born into some unfortunate circumstances and is keeping in school another year thanks to your support. Distribution of 71 sweaters to the needy children of Bal Mandir school in Besisahar. 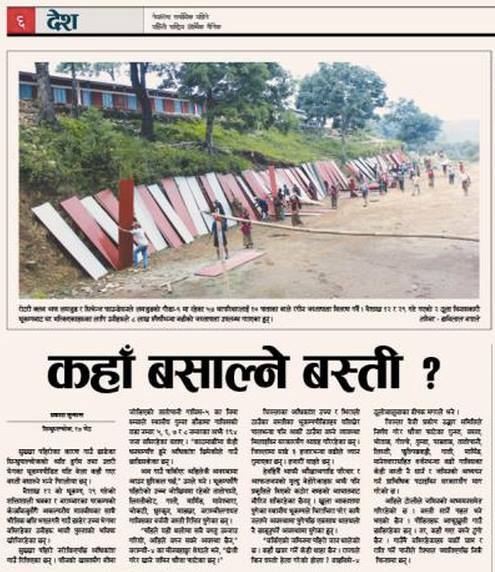 This work was carried out in partnership with the Rotary Club of Lamjung. Many thanks to our donors for helping these children out during the winter months! Pramila broke her arm after falling off a Nepali swing and was unable to afford treatment. She was born into one of Nepal's lowest castes and is taken care of by her grandmother in a neighbouring village. We've provided surgery to her and are currently working with her on her recovery. In partnership with the Rotaract Club of Pokhara-Fishtail, SCF has funded 21 rechargeable lamps for students preparing for their final examinations. With daily power outages up to 10 hours each day, these lamps will allow kids to study at their homes throughout the evening hours. Lots of love from Priya for the SCF Scholarship and helping her keep in school ! Tulsi is a brilliant kid who has some unfortunate economic circumstances at home. Tulsi and her three siblings rely entirely on her mothers labor. With your help, she is now back in school and has our full support to continue her education. Niruta and Samjhana are sisters and were born into extremely unfortunately circumstances. See Change Foundation will be covering their yearly tuition to keep in school! Hey all, it has been a while! We did some fundraising on Facebook back in January for Shanti Maya. Here she is receiving her scholarship from See Change Foundation - thanks to all of you! SCF Volunteer Judy meeting with three of our latest scholarship recipients Chankhe, Bipin, and Sanjaya. These kids are able to stay in school thanks to all of your support. SCF Volunteer Judy meeting with one of our scholarship recipients Samjhana and her father. We are keeping this young lady in school by covering her tuition, uniform and school supplies. Thanks to you all ! Surya received multiple injuries to his body and skull while cutting grass for his livestock. Surya was prematurely discharged from the hospital before SCF got word of him. We covered 75% of his surgery costs while the remainder was funded by the local community. 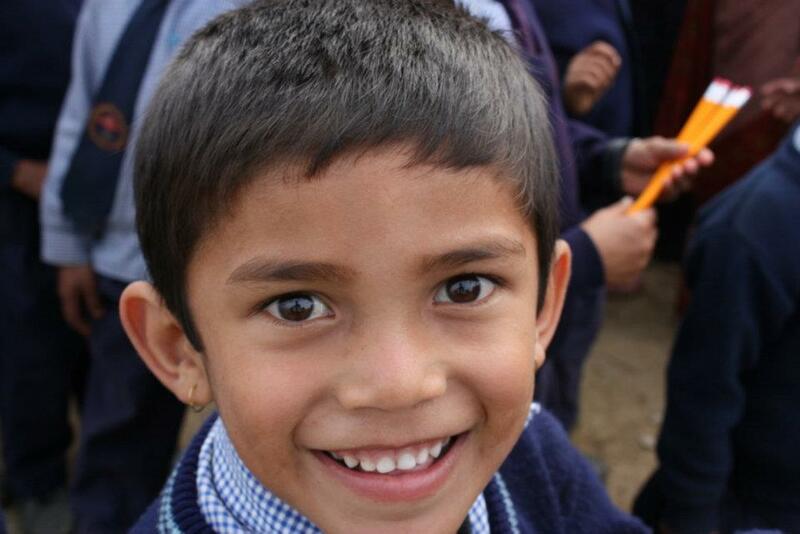 We would like to give Bikash a chance to study at a local private school in his village. 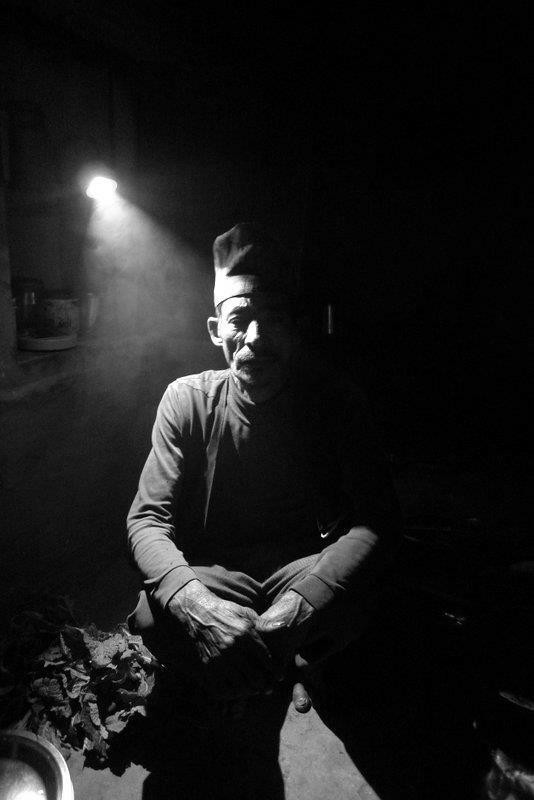 He was born into a lower "caste" in Nepal which puts his family against the odds in society. Both of Bikash's parents earn income through their physical labour. Gautam lives with his mother and together they live off of what she earns from her own physical labor. We'll be covering his scholarship so he can keep in school and continue his education at a local private school. Saraswati was abandoned as a small child and has since been taken care of by another villager. We'll be putting her in a local private school so she can get the best education available. Erik standing next to our latest scholarship recipient Bishnu! Taken at the Lamjung Skills Development Foundation where she is continuing her education in carpentry thanks to you all! See Change Foundation partnered with the Rotary Club of Lamjung to sponsor 15 parentless children with school uniforms, backpacks and supplies to celebrate Children's Day in Nepal on September 14th, 2013. 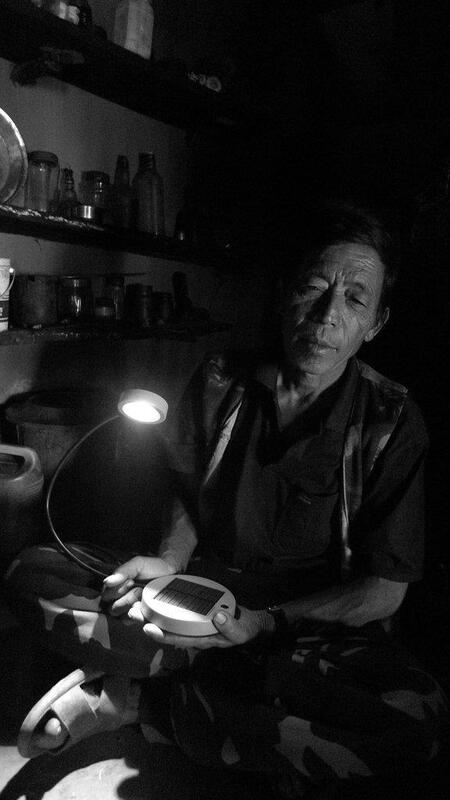 SCF donated solar rechargeable lamps and radios to rural villagers who do not have proper access to electricity. Pratikshya is one of the children living at the IWCDC Children's home. She contracted a skin problem that is spreading across her hands and arms. SCF got her to a hospital in a major city for treatment and subsequent checkups. 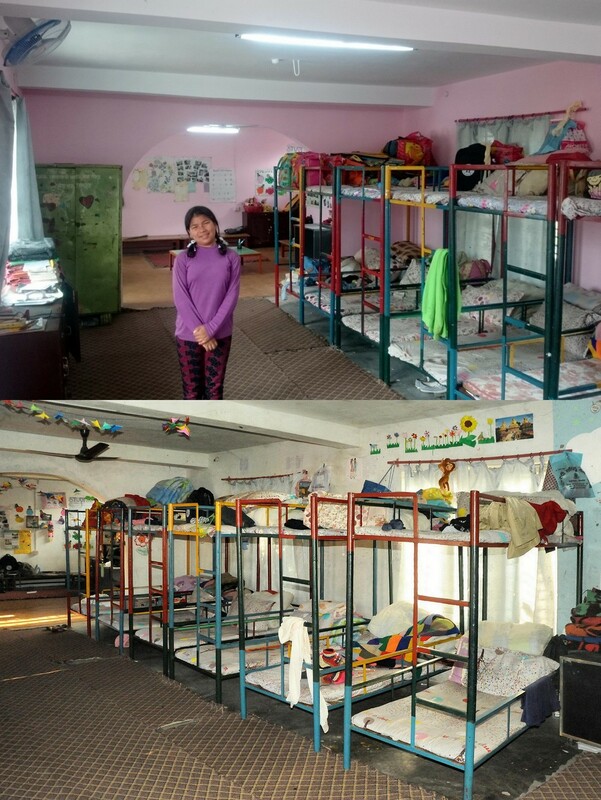 SCF installed a new water tank, roofing, security wall and dormitory carpeting for the children at IWCDC. No more rain in the kitchen, water shortages or studying on cold cement! SCF has donated 5 laptops to a remote village. Volunteers are teaching basic skills such as basic use and word processing. 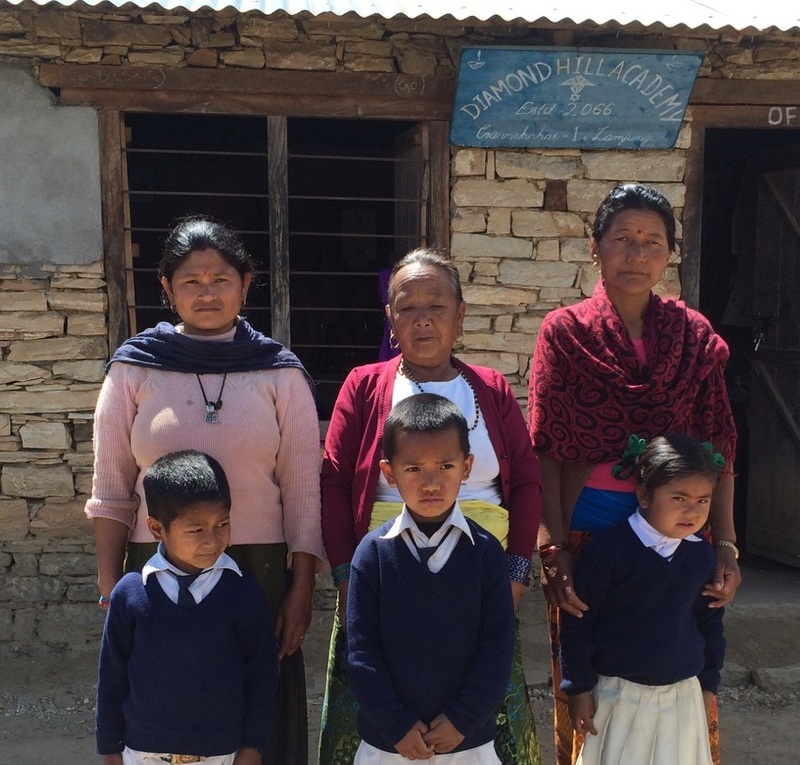 SCF has constructed 2 new classrooms and toliet for a remote school in the district of Lamjung. 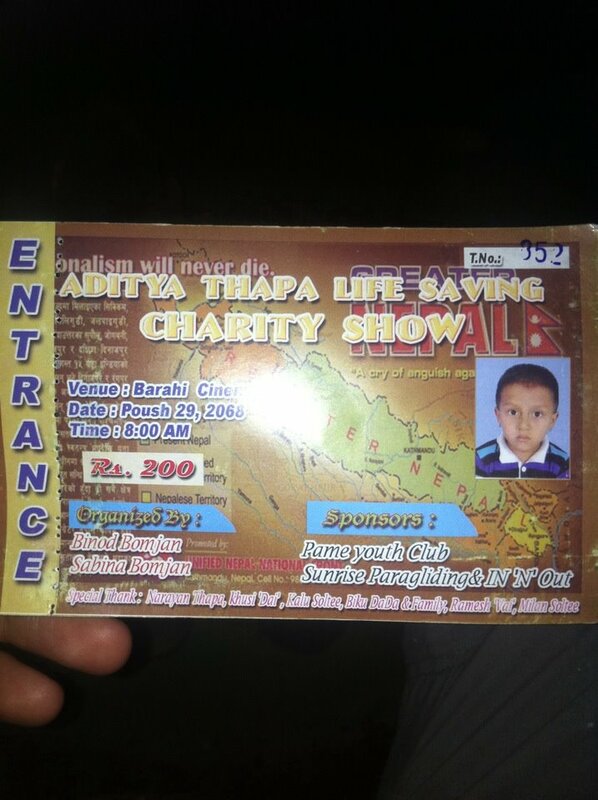 SCF has helped fund a heart valve transplant for Aditya, a 7 year old boy in the Kaski district. He's doing great after his surgery and is busy being a kid again! 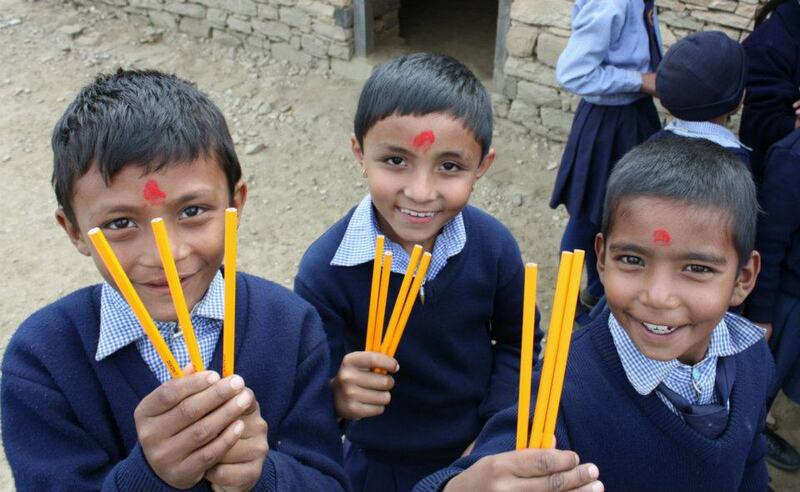 SCF has donated thousands of pencils, erasers, stickers and notebooks for a rural school in Lamjung Nepal.